Habit: Perennial herb [shrub]. Stem: generally twining or trailing. Leaf: opposite, generally +- persistent; blade thread-like to narrow-lanceolate. Inflorescence: at nodes, umbel-[raceme-]like cyme. Flower: corolla lobes +- spreading to erect-incurved, ring of tissue at corolla base present or not; filament column appendages +- 0 or free from each other, fused to ring of tissue at corolla base or not, +- spheric, attached to base of filament column, without projections, hollow (possibly due to complete fusion of margins), anthers fused into anther head around and fused to pistil head, pollen in pollinia; pistil head flat or, if +- conic, 2-lobed or not; nectaries in stigmatic chambers. Fruit: generally 1, erect or pendent, narrow-fusiform to lance-ovoid, with fine longitudinal grooves [or smooth]. Chromosomes: 2n=20,22,40,44 (reports not including California plants). Species In Genus: +- 40 species: North America, Africa to Australia. Etymology: (Greek: fleshy crown or wreath, from sac-like filament column appendages of some species) Note: Our species treated as Cynanchum, Sarcostemma in TJM (1993), both shown to be polyphyletic in previous, broader circumscriptions (Liede & Täuber 2000, 2002). Habit: Plant +- green, minute-hairy especially at nodes, dense-white-hairy at base. Leaf: petiole +- 0, blade 15--40 mm, thread-like, in age reflexed, persistent or not. 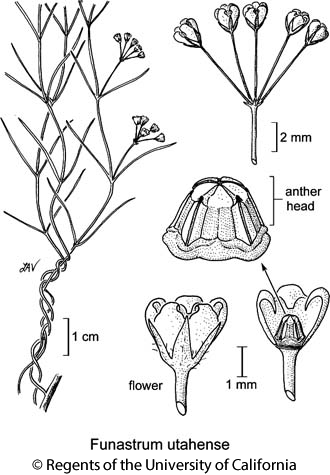 Flower: corolla 1.5--3 mm, yellow, in age orange, ring of tissue at base 0, lobes erect-incurved, meeting above anther head, adaxially concave (hood-like); filament column appendages +- 0. Fruit: generally 1, 4--6 cm. Citation for this treatment: Thomas J. Rosatti 2012, Funastrum utahense, in Jepson Flora Project (eds.) Jepson eFlora, http://ucjeps.berkeley.edu/eflora/eflora_display.php?tid=81803, accessed on April 22, 2019.